Posted by showmescifi in piracy, Sci Fi, science fiction, sciencefiction, scifi, stargate, stargate atlantis, TV. First off – piracy is bad. No one should pirate or illegally download or distribute pirate versions of TV shows and ShowMeSciFi certainly doesn’t support or encourage the practice. That said – it happens, it’s out there now and that’s reality. It has come to our attention through anonymous sources (privacy of the press and all that) that there are pirate version of Stargate Atlantis Season 4 available for download before they air. So far it has just been 4×1 Adrift and 4×2 Lifeline. Apparently they’re pre-broadcast copies (not iTunes) and..get this…they’re missing all the sound effects for the special effects. So no sounds for things like drone fire from a jumper, background theme and even stuff like announcements over the Atlantis comm system. You know it’s only $1.99 an episode to buy from iTunes of Amazon Unbox but hey a buck is a buck. Personally speaking, I like sound effects. Posted by showmescifi in jewel staite, Sci Fi, science fiction, scifi, stargate, stargate atlantis, TV. In its fourth season …Stargate Atlantis has now got to be the finest SciFi show on TV. The season 4 premiere titled ‘Adrift’ was really solid..with all the elements that make Atlantis great..namely continuous failures that the crew someone don’t quite get out off..and interesting twists that really make you go ..HUH. For example..they finally clear the asteroids..but DANG one got through and took out the hyperdrive. They finally fix the hyperdrive and..DANG..too late they don’t have enough ZPM power. The whole point of why Atlantis left the Atlantis world was to escape the replicators…so what do these braniacs do? They come up with a plan to go to the replicator homeworld to steal their ZPMs. Oh and great to see Jewel Staite really take over the Doctors role (which she’s had since 3×20) and AWESOME to see Col.Carter too. Posted by showmescifi in Amanda Tapping, Sci Fi, science fiction, scifi, stargate, stargate atlantis. It’s official. Col. Samantha Carter (Amanda Tapping) takes over command of the Atlantis expedition in Season 4. Dr. Weir will be removed after either quitting or being fired by the IOC. This isn’t the first time Weir will have been removed from a Stargate command. She was removed from command of the main of SGC too and replaced by none other than O’Neil. (Weir replaced General Hammond). Finally the military will be in control of Stargate Atlantis and finally the smartest person will be command in stead of a diplomat that has no real scientific or military skills. Congrats Col. Carter and Welcome to the Pegasus galaxy. Posted by showmescifi in science fiction, sciencefiction, scifi, stargate, stargate atlantis. Jewel Staite finally takes over as doctor and Dr.Weir’s days are obviously numbered. A pretty decent final episode for the season with an alright cliffhanger. Sure we’ve seen enemies of Earth use an Energy weapon through the gate before (think Annubis in Season 8 of SG-1). Why they didn’t just fly an attack against the originating gate address is beyond me. The fact that first they submerge and then they use the Stardrive was kinda nuts that must’ve sucked a load of power. Anyways..great episode and I can hardly wait the X months until the show finally comes back! Posted by showmescifi in Rachel Luttrell, scifi, stargate, stargate atlantis, teyla. Teyla is having a baby! Well, actress Rachel Luttrell, who plays Teyla on Stargate Atlantis is and for season 4 the writers are writing it into the storyline. Apparently the baby belongs to someone we haven’t met yet….but i think it would be FRAKKIN AWESOME if it was John Shephard’s . That sure would complicate things. Then again maybe she was impregnated by a wraith like entity so her baby will be the promised child the bridges human and wraith culture. overall a weak episode with a Wraith queen that could’ve been alot more than just another…oh the Wraith are here and are gonna blow us up. Posted by showmescifi in carson beckett, dr carson beckett, Paul McGillion, science fiction, sciencefiction, scifi, stargate, stargate atlantis. OK. Sunday (Stargate Atlantis 3×17) has finally aired in the US (though ShowMeSciFi blogged about it back in February originally). Dr. Carson Beckett didn’t have to die. For those that don’t read this blog or look for spoilers online, they had no idea what was coming. I got calls from a few friends after the episode aired asking me what the FRAK happened – AFTER scolding them for not reading this blog we had some great discussions. The SciFi website gives no indication in its episode synopsis that Sunday has anything to do with Beckett. In fact they make it seem like Dr. Weir going on a date is the BIG plot. Becket was just going about his dangerous business as he does in every episode, disposing of the exploding tumor was no more or less dangerous than anything else we’ve seen him or anyone else on Stargate Atlantis do. Yet somehow this time Beckett dies. There is an explosion and then we see his flag draped coffin. It was an empty death for a noble character – he deserved much better. Sure the multiple flashback approach for the plot in this episode was great but none of it justified the death of Beckett. Word is that Becket will now return in Season 4. Seeing as he was – plain and simple – blown up real good – i don’t see how he can come back. It’s not like he ascended or anything. Maybe it will be a clone or replicator version of Becket but the original Scotsman is dead. The piper has already played the pipes for him. Beckett’s death was an empty one – even more empty than Tasha Y’aar in Star Trek. The way Trek brought Tasha back was kinda neat though..here’s hoping Stargate Atlantis’ writing crew comes with something as inventive. Posted by showmescifi in science fiction, scifi, stargate, stargate atlantis. How many episodes have their been of Stargate that are similiar to this one? The basic premise of coming across a ship/location with frozen/stored persons is tired in the stargate universe and overused. The ARk offers nothing new in this respect and is similiar to the umpteen other Stargate’s that were the same. Posted by showmescifi in science fiction, sciencefiction, scifi, showmescifi, stargate atlantis. Great episode..not an entirely new idea for SciFi but definitely a new idea for Atlantis. McKay vs Sheppard in a Pegasus galaxy REAL version of Age of Empires (or maybe Sid Meyer Civilization?). Atlantis is digging deeper than ever into the SciFi well to deal with interesting plot lines and themes that go beyond the simple – let’s kill some wraith episodes. Stargate Atlantis Season 3 episode 14 The Tao of Rodney – is another one of those where a Stargate character gets super-human powers and must get rid of them or will die. In this episode the ‘victim’ is Rodney and the ‘twist’ is that the super-powers come from an ancient ascension machine…problem is Rodney is neither willing (or apparently able) to ascend. Sure this kind of thing happens all the time on Stargate (SG-1 or Atlantis), but it’s still decent fun, though not an episode that I’ll likely care to see more than once. Posted by showmescifi in science fiction, sciencefiction, scifi, stargate atlantis, stargate sg1. Parallel Mirror Universe stuff is no stranger to SciFi or Stargate. Stargate SG-1 Season Ten episode 15 The Road Not Taken is not the best parallel universe episode to ever appear on Stargate SG-1 but it certainly was entertaining. I tend to prefer mirror universes where the good guys are evil – in this case Landry as President of the US is just a bit evil but still..
Only a few more episodes left and then that’s it for US broadcast TV’s run for Stargate SG-1. Jenai strongman Kolya and Sheppard have had a serious hate on since the first time they met. FINALLY – in this episode they settle their score (or so we hope). The Lucius angle in this episode is terribly cheesy and actually works quite well to setup the final Jenai Kolya showdown. If I had shot this episode, I likely would have stretched out the final shootout just a bit..but as it is, it’s great stuff. Sheppard stares down Kolya..offers him the chance to surrender…both men’s hands angle towards their respective firearms. Shootout in the Pegasus Galaxy. GREAT stuff overall. When the people of Atlantis begin to have visions of ghosts, Teyla believes the apparitions are actually Ancients unable to ascend warning them of a great danger. Kind of a weird episode – but Stargate Atlantis does a great job of tying in stuff from previous episodes. In this case, it’s the whales that live on Atlantis. We had this episode figure out about half way though, but still solid entertainment that’ll keep you in your seat for a full hour. FINALLY! It’s back Stargate Atlantis is back…thank the ancients!! AND what a great episode too. No surprises really as the main Stargate Atlantis crew retakes the city from the replicators. It’s too bad that the replicators killed all of the ancients – or so they claimed – might make for some interesting future plots. Then again the Atlantis crew tends to run into ancients at least 3 times a season as it is. Also it’s not likely that we’ve seen the last of the replicators either – they still have their whole replicator world and next time around likely won’t be as ‘easy’ to defeat. All in all a very welcome return for season 3.5 of Atlantis – a solid show with non-stop action. Posted by showmescifi in scifi, stargate, stargate atlantis, stargate sg1, stargate universe. It’s official! Following in the footsteps of Stargate SG-1 and Stargate Atlantis will be the new Stargate Universe Series. Details on the new series so far are very sparse- we don’t know for example when the show will actually air. Though it is being targetted for sometime in 2008. BUT we do know that it won’t be a prequel or something in the far future, though it’s not a spin off of either of the two existing franchises. Apparently the show will also deal with the 9th Chevron the stargate (most addresses requiring 7 chevron with the 8th being for distance). More information (though few hard details) are available in the full length interview on Gateworld. Posted by showmescifi in scifi, stargate, stargate atlantis. We already know that Samantha Carter is moving over to Atlantis starting next year when SG-1 is off the air. Now word has come that that Teal’c (brilliantly played by actor Christopher Judge) will be on Atlantis too. Don’t get too excited it’s only a guest spot according to early reports but it does give hope. Hope that SG-1 characters can continue to co-exist even when their show is only available on DVD. Posted by showmescifi in jedi, klingon, scifi, SCIFIPEDIA, sith, Star Trek, Star Wars, stargate, stargate atlantis, stargate sg1, startrek, starwars, wikipedia. SciFi.com is now actively promoting its own SciFi wiki called SciFipedia. It’s an effort to build out a complete ‘encyclopedia’ of SciFi shows, characters, games and other such trivia. SciFi.com is expecting/hoping that people will freely give up their time and knowledge to help build out the content. Not a bad idea and one that Wikipedia has proven works. There is a big glaring monstrous problem with it though. Wikipedia is totally different in that the GNU Free Documentation license and Creative Commons licenses are all about letting information be free. Part of the incentive of contribution is knowing that you’re setting information free for any/all to benefit from. Speaking of contributions, at Wikipedia anyone can contribute at any time. There is no need to register if you don’t want too. I’ve contributed many hundreds of entries to wikipedia and have never once registered. With Scifipedia you have to register or you can’t contribute. The policy for SCIFIPEDIA is that only registered members will be allowed to contribute entries. The registration will be handled though the SCIFI.COM main website, and registered SCIFI.COM members need only log in. A name and email address will be required, and you’ll need to follow an authentication procedure to become a registered member. Then last but perhaps most importantly is the fact that Scifipedia has only 4,710 entries or so. Wikipedia greatly outstrips that already, containing the same and alot more in SciFi than SciFipedia. I’m saying if you’re going to give of your own free time and will to help enrich and educate why not do so in the most free, most collaborative and most used media the world has ever known. Forget about scifipedia – contribute to Wikipedia. Posted by showmescifi in scifi, stargate, stargate atlantis, stargate sg1, YouTube. In fact if you don’t want to wait until April (or later) to see the most important moment of Season 3, you don’t have too. WARNING ! The video below shows the funeral of Dr. Carson Beckett, if you don’t want to wait till it airs then don’t click play. Otherwise, without any further ado…the Funeral of Dr. Carson Beckett. Posted by showmescifi in scifi, stargate, stargate atlantis, stargate sg1. Amanda Tapping who plays Lt. Col. Samantha Carter on Stargate SG-1 is moving to Stargate Atlantis as a full time character starting with season 4. Stargate SG-1 ends its 10 year run this year and will live on in direct to DVD movies. Tapping is now signed up to be in 14 of Atlantis’s 20 episodes. Will she end up as McKay’s love interest (hope not)?! With two braniacs on the Atlantis base, i hope the action quotient stays high..and hey Col Carter is certainly no stranger to action. StarGate SG:1 lost its first doctor and apparently Stargate Atlantis is set to loose its first Doctor too. 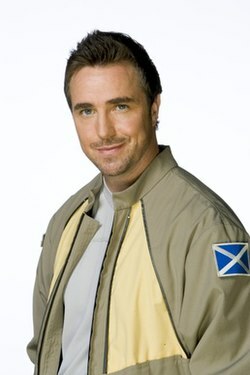 Paul McGillion will no longer be a regular cast member, with his character Dr. Carson Beckett departing in the second half of Season Three. If you want to try and save him check out SaveCarsonBeckett.com . Eclipse Magazine has the full interview with Paul McGillion.